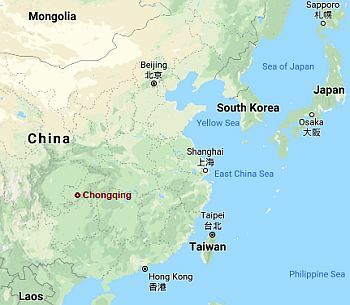 In Chongqing, a great metropolis of south-central China, the climate is temperate, with fairly mild but cloudy winters and hot and muggy summers. A city with a millennial history, Chongqing is today a megalopolis, polluted as often happens in big cities of China. Because of its position in a plain far from the sea and surrounded by mountains, it is very hot in summer, actually it is one of the hottest cities in China, while in the other seasons (but also on summer nights), it is often cloudy and foggy. The city is located at the meeting point between the Jialing and Yangtze rivers. Precipitation amounts to 1,100 mm (43 in) per year, with a maximum between late spring and early summer, when it occurs in the form of showers and thunderstorms (often at night), and a minimum in winter, when it is very weak, though quite frequent. Here is the average rainfall. Winter, from December to February, is quite mild, in fact, the average January temperature is 8 °C (46.5 °F). However, there may be cold periods, with maximum temperatures around 5 °C (41 °F), and sometimes even snowfalls. In any case, the sky is often cloudy. Spring, from March to May, is initially mild, and becomes gradually warmer but also rainier. In May, there are already some warm and summer-like days, at least as regards to the temperature. Summer, from June to September, is hot and muggy. The distance from the sea and the humidity make the heat annoying, especially in July and August. There can be oppressive periods, especially in July and August, with highs around 38/40 °C (100/104 °F) and tropical nights. In August 2006, the temperature reached 43 °C (109.5 °F), and there have been 13 days with highs equal to or higher than 40 °C (104 °F). However, July and August are also the (relatively) sunniest months of the year. Autumn, in October and November, is generally mild, and gradually becomes cooler, and then quite cold at night by November. The rains gradually decrease, but the sun becomes less and less frequent. 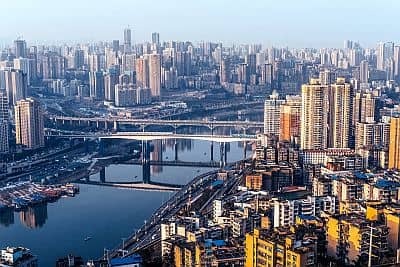 The amount of sunshine in Chongqing is very poor: the only months when the sunshine hours exceed 40% (but they still remain below 50%) are July and August, while from November to February, the sun is almost never seen. Here are the average sunshine hours per day. The best times to visit Chongqing are spring and autumn, in particular, from mid-March to mid-May and from mid-September to mid-November.